Damp Proofing Bridgnorth – Damp proofing of lounge, hallway, dining area and kitchen. 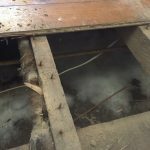 Our client had experienced many years of damp creeping into their home in almost every room to the ground floor of the property. After surveying the issue and identifying the problem areas and how best to treat them Damp Proofing Solutions began work. We started by removing skirting boarding as required before removing the damp/salt contaminated plaster up to a metre high. The remedial damp course was then drilled and injected and a coat of liquid damp proof membrane applied as required. The walls where then prepared as necessary for the application of a render coat containing salt retardant chemicals, this was ruled off and made flat. The final stage in the damp proofing of our clients home was to apply a smooth finish plaster to match the original walls. Excellent service provided by Damp Proofing Solutions, very clean and tidy. We wished that we had employed them to carry out the work many years ago.